string(1163) "Resource Centre > Uncategorized > Responsible Recruitment: Remediating Worker – Paid Recruitment Fees"
A major cause of forced labour in global supply chains is the charging of recruitment fees to migrant workers. Some companies have sought to reimburse workers charged these fees, many face serious challenges in doing so. Reimbursing worker-paid fees is an important step consistent with the UN Guiding Principles on Business and Human Rights, which clarify the baseline expectation for companies to respect human rights, including providing for or cooperating in remediation when they have caused or contributed to adverse human rights impacts. 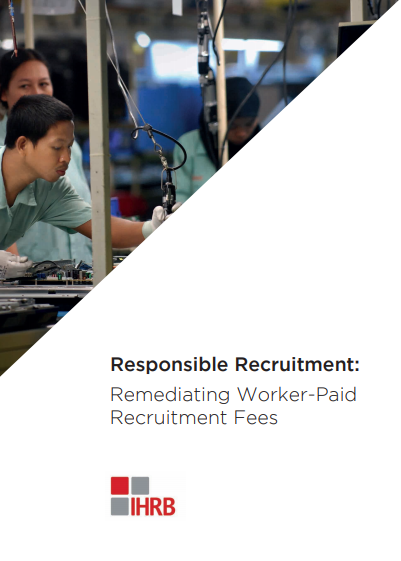 This report profiles six multi-national companies who have sought to address access to remedy by reimbursing workers found to have paid fees. Each of the remediation programmes vary in size and structure and have been shaped by the local contexts in which these companies operate. Together, they have provided a form of remedy for thousands of workers amounting to millions of dollars in the last decade.